Scratch the ham sandwiches. 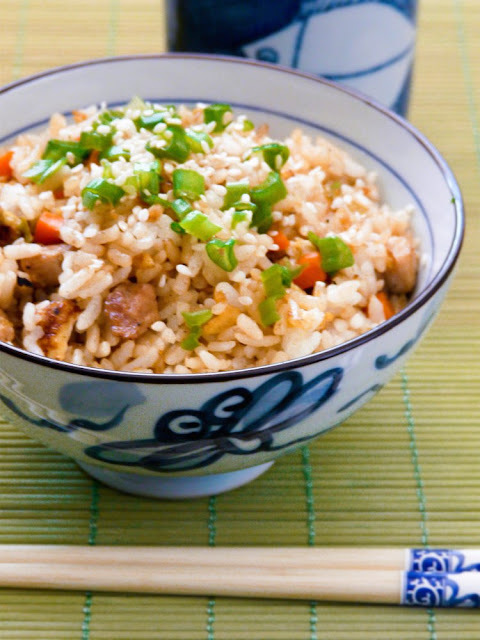 Today, I broke off from my menu and made this pork teppanyaki fried rice for lunch instead. I have a good reason though. My son's best friend had stayed the night and he happens to love my cooking, especially my fried rice. I won't go into too many details except to say that this poor kid has suffered through quite a bit of bad luck and heartache this year. I feel for what he's gone through and for what he's still going through so if my fried rice can bring him some comfort and delight, then it's totally worth it. When I go to a teppanyaki restaurant, their fried rice is often the biggest draw for me, next to the fancy knife work. I usually watch in fascination as they slather ungodly amounts of butter onto the super hot grill followed by garlic, peas, carrots, rice and a good amount of soy sauce. The chef will then deftly chop up some green onions for garnish and finish it off with a few sprinkles of sesame seeds on top before dishing it out to the eager crowd. 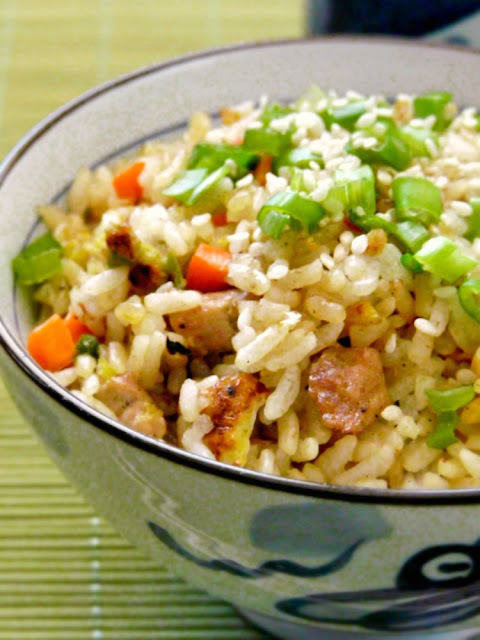 Although this is an easy recipe to emulate at home, I try not to make this type of fried rice too often because of the generous use of butter. 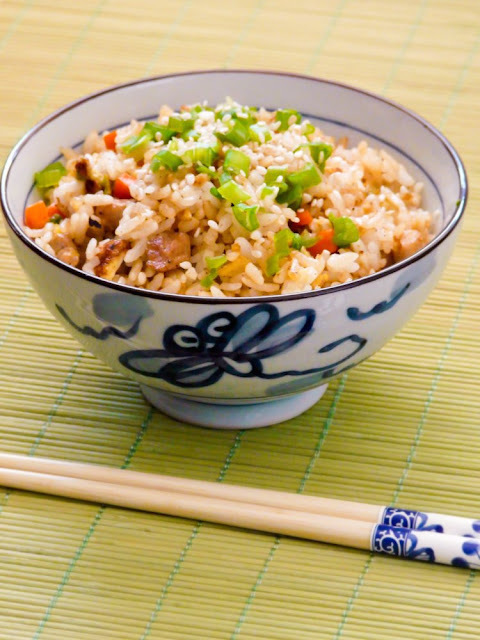 However, when life calls for a good bowl of fried rice, this recipe won't let you down. On left: day old rice, minced garlic and butter. 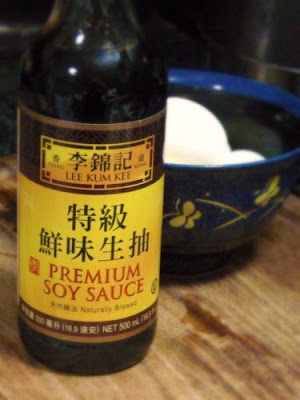 I recommend using a good quality soy sauce. I like the Lee Kum Kee brand. 1. Season the pork with a little salt and pepper. 2. Heat a wok over high heat. Add a tablespoon of butter to it and allow it to melt. Add the minced garlic to the work and cook for half a minute, stirring constantly to prevent it from burning. When the garlic is fragrant, add the minced pork to the wok and stir fry for a few minutes until no longer pink. Next, add the diced carrots and white stem portions of the green onion to the wok. Continue to stir fry for a few more minutes so that they soften up. 3. Move the ingredients off to the side of the wok and add the beaten egg in the center. Scramble the egg quickly. Once it has solidified, mix it into the rest of the ingredients. 4. Add the rice, soy sauce and remaining butter into the wok. 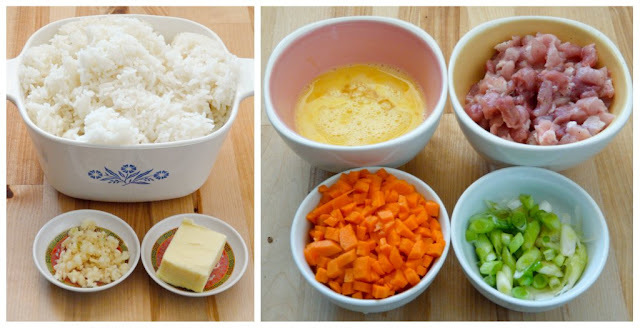 Break up the rice and mix well with the other ingredients. Stir fry for 5 to 8 minutes or until the rice has softened and is heated through, and the soy sauce and butter has coated the grains. Pepper to taste. 5. Transfer to a large dish or serve in individual serving bowls. Garnish with chopped green onion (the green part) and sprinkle sesame seeds on top. Serve hot.